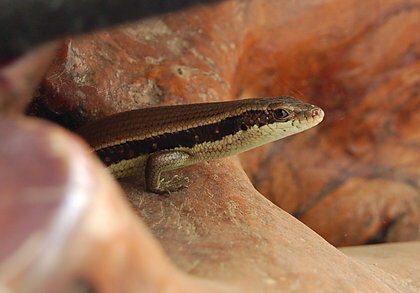 Yeah, cool, but what is skink sititing on? It looks like a corpsified ear or something! Oy, it make me remember “Star Trek: The Revenge of Khan”, Ricardo Montalban’s finest and most sadistic film moment. It’s an ugly teak table that I banished to the outside of the house. It attracts wasps, centipedes, spiders of impressive size, and now fat skinks, as well. Previous PostPrevious Nam Opened for Yoshimoto!